I’ve got some bad news Oppo. I knew this might be coming for a few weeks, but now it’s official, Stateline Rallycross is dead. There’s nothing about the end on the website, but it was announced on Facebook last night. I feel like I’ve lost a friend, which is silly, but I had such an unbelievable amount of fun there. I know I’ve written about it time and time again, but I don’t feel like I’ve ever been able to fully communicate how great it really was. Insurance costs have become too much to bear for the owner. I found out that over half of the $100 event fee was being eaten by the insurance ... crappy insurance at that. Damn the lawyers and the fun police! The good news, is that the Milwaukee SCCA may start holding events at Byron this year. The nice thing about that will be a reduced cost for running the event, as their insurance is orders of magnitude cheaper. Unfortunately, that means the part of the course with the most character, the thing that really made Byron such a unique place to run, will have to be abandoned. SCCA won’t let you run on anything that even looks like it might be a jump, and you can’t come within 50 feet of a tree. That’s unfortunate, but thems the breaks. The other upshot, is that the new course will be much easier on vehicles. Apparently part of the problem we’ve had with retaining competitors, has been how punishing the Byron course is on the cars. The owner of Byron will have to grade the place much smoother than has been done in the past, in order to make it happen. Luckily, we got him hooked on the sport this year, so he’s willing to do that. I will always be grateful for the time I got to spend there, and the times I got to run on the full course. It has been the absolute highlight of my vehicular life, hands down. I want to extend a tremendous thank you to those of you who made the events happen (I know you guys lurk here), you are all rock-stars my friends. So, I guess in the end the RallyMetro lasted the exact right amount of time. 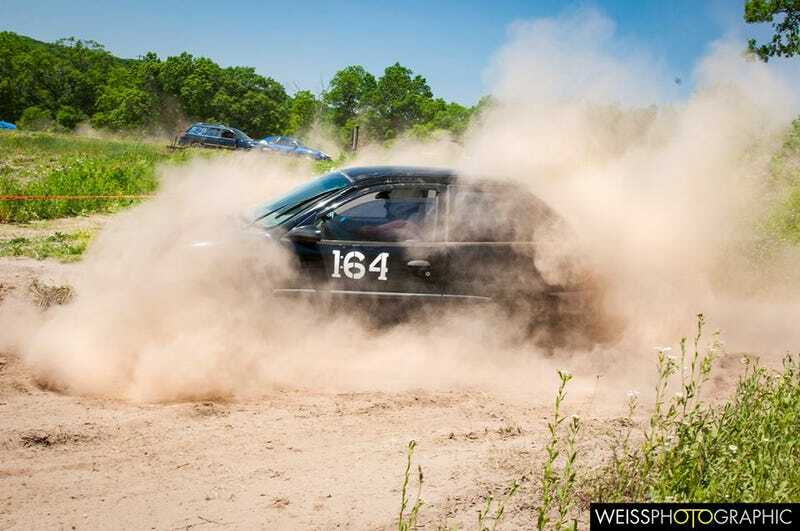 Both it and Stateline Rallycross as a whole ran their last events together. Unfortunately, I’ve had to come to terms with the fact that I will not be replacing the RallyMetro this year anyways. I need to focus my financial resources on paying off that kitchen. You know, the one I’m not even done with. It’s not that I can’t afford to divert a few hundred into buying another beater, but it would be bad family leadership to tell my wife she needs to clamp down on her spending, while I go out and buy another race car. With that, I will sign off of the RallyMetro tag once and for all with my favorite picture. Going out in a blaze of glory! Pour one out folks. It was fun while it lasted.